This election deals with fundamental legal rights. 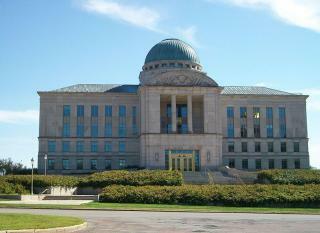 The court found that the Iowa Constitution did not permit discrimination by the State in the issuing of civil marriages. The push to recall the three justices up for retention is organized as part of a larger effort to circumscribe Iowan's civil rights. This should be of concern to everyone - not citizens who are gay or lesbian. This election will determine whether we are people want to be governed by religious doctrine or the civil rights granted by the Iowa Constitution. The arguments put forth by people opposed to the Varnum decision are fundamentally (so to speak) religious in nature rather than civil/logical. The court found no substantial logical basis in restricting civil marriage to heterosexual couples. They are correct. I discuss the actual arguments here. This election will affect the balance of power between the three branches of State government. Independent judicial review is critical to balance the law-making and administrative powers of the other two branches. Particularly when it comes to civil rights, the job of the Supreme Court is to protect citizens against incursions by the legislature and governor. This is a place where political conservatives, libertarians, and liberals should all align - except for the injection of religious doctrine. The importance of this particular question is perhaps the only thing that Bob Vander Plaats and I will ever agree on. It is critically important all people who are committed to equality and the rule of civil law be vocal about their opinions - before the election, in the voting booth, and as we sort through the post-election rubble. It is a mistake to view this issue through the narrow lens of gay marriage. The impact of enshrining specific civil rights discrimination in the State constitution should scare everyone. Please vote to RETAIN ALL THREE SUPREME COURT JUDGES. In a related ballot question, it is also important to VOTE NO on CONSTITUTIONAL QUESTION 2 (Shall there be a convention to revise the Constitution, and propose amendment or amendments to same?) - This is a related effort to address the Varnum decision through a constitutional amendment.